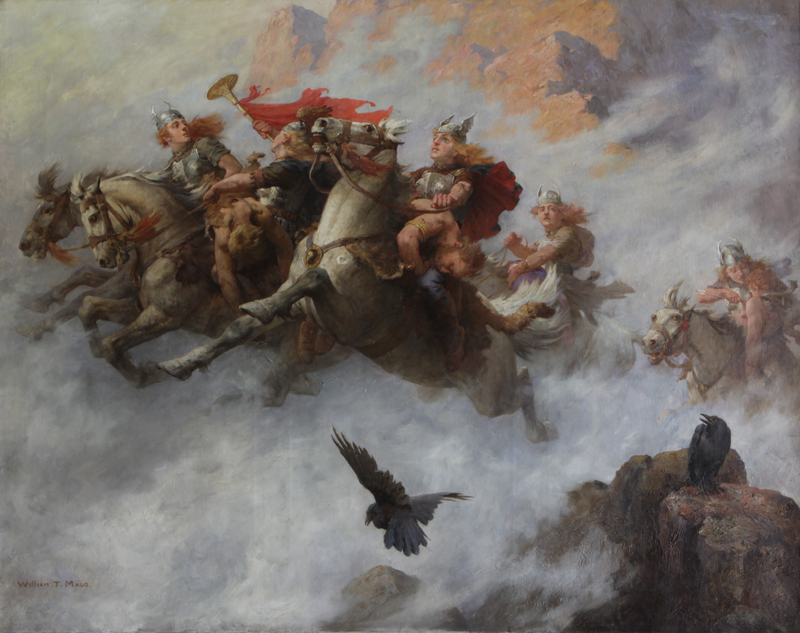 William T. Maud is a virtually unknown nineteenth century British artist and The Ride of the Valkyrie is his only known painting. During the Boer War (1899-1902) Maud worked as a war artist for the news organization The Daily Graphic – a British illustrated news journal. With the massive growth in literacy throughout the British Empire, coupled with the development of the global telegraph network, the illustrated news weekly flourished. Newspapers sent special war artists to the battlefields to create pictorial records of specific battles, as well as to sketch images depicting everyday life for soldiers on the front line. Many artists of this era took this dangerous assignment for the simple reason that it was more lucrative than painting in a commercial studio. The war artists were untrained for the battlefield, but by virtue of their vocation they were placed in the middle of the action, exposing them to the risk of injury, capture and disease. With pencils, brushes and sketchbooks their job was to go wherever the winds of combat blew, to live under fire, to endure the deprivation, hardship and danger of the campaign, and to send to the illustrated newspapers that employed them rough and hasty sketches. William T. Maud died from enteric fever while covering the Second Boer War; he was only 38 years old. In Norse mythology, a Valkyrie is one of a host of female figures who decide who will die in battle. The Valkyrie bring their chosen to Valhalla, the afterlife hall of the slain. According to the legend, the heroes who have died with great bravery on the battlefields will have their wounds miraculously healed when they arrive in Valhalla. Valkyrie also appear in myths as lovers of heroes and other mortals, sometimes accompanied by ravens, and sometimes connected to swans. Valkyrie have been the subjects of various poems, works of art, and musical compositions. For example, Valkyrie play a major role in the 1870 opera by Richard Wagner.